1.) I agree that the user extensibility is a key piece to the success of this plugin. Initially I started with outlets and switches (as well as low voltage, and panels) where this is less of a concern however with other electrical devices I am providing a system whereby the user can utilize their own components: lights, safety devices, heaters, vents. Currently the user cannot edit or utilize their own categories (and corresponding 2D symbols) however to enable this level of customization also requires that the user be able to determine which parameters are applicable to that category (ie. ceiling vs. wall mounted), so it does become a bit more complicated than at first blush. I also was looking at this plugin from the point of the more casual user (DIYer) who does not have the inclination nor the experience to develop a whole host of electrical devices (accurate and low poly) to populate the (empty) plugin’s library folders. So at the very least I needed to provide some basic switches, outlets and other standard devices. I wanted a certain “out-of-the-box” aspect to this plugin, but at the same time allowing the more advanced user the ability to customize and extend the plugin to meet their needs. If anything I feel like I need to provide more pre-built components, high quality components that either are packaged with the plugin or are provided as optional “packs” that can be installed at the users discretion. 2.) Initially I only meant to spend at most about 2 weeks of my time on this plugin but as I developed it further both in real terms and conceptually it has managed to absorb more time and energy than initially projected. There really has been very little in scope creep, surprising based on my history with all of my other plugins, but my 2 week time frame stretched out into a 2 month period. This is not to say I have not been working on other plugins, its just that I’ve been stretched very thin, now dividing my time between five different plugin projects as well as the engineering tools on my website. I actually spent about a week of my time last month reworking and updating my wind speed algorithms within the Medeek API and Basic Wind Speed Map. I’ve also been forced to update many of the Google maps API calls (dynamic and static maps) on my online design criteria maps due to Google changing their system and BREAKING my website, unfortunately that is still an ongoing project. Then to top it off my new server I installed at the beginning of March began to have hardware issues which required me to yet again divert my attention away from the plugin development. We will get there with the shed and gable walls, perhaps in the next couple of weeks I will finally be able to release this feature for public consumption. 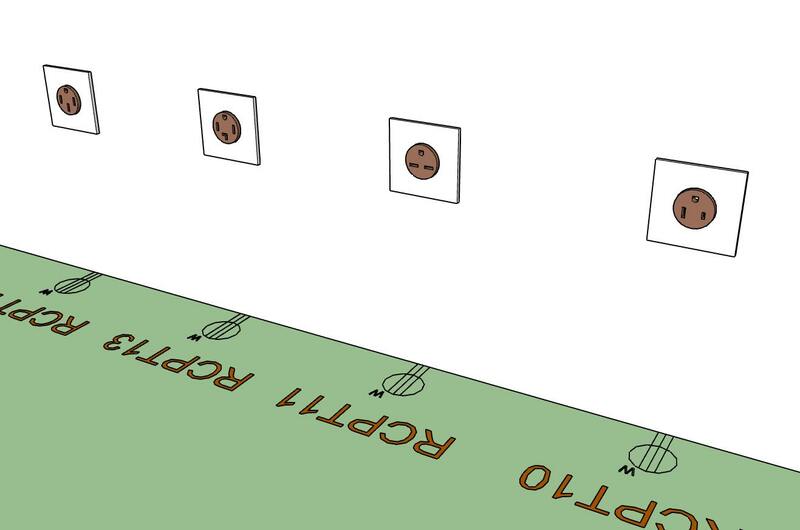 I have returned my focus to the Wall plugin with the release of this latest feature (electrical symbols legend). To be perfectly honest I am at a point where I now realize that to reach the goal posts in a reasonable amount of time I need to somehow increase not only the speed of my development but also the breadth. In short, I could really use some help with all of these plugins and the burgeoning to-do lists associated with each. However, as always it comes down to user uptake. In order to accelerate my development I need more revenue but I’m already pushing the limits as far as what the SketchUp community will accept with regards to pricing levels of these plugins. I have purposely kept the larger plugins below the $100 mark, this seems to be the magic number. If the plugins are priced above this mark the uptake begins to take a noticeable and dramatic downturn. The question really is are their enough potential users of the plugins to fully support their development? I don’t have the answer to the that question but so long as I have enough revenue coming in to just squeak by I will keep plugging away at it and if the day every comes that I can bring on additional help to speed things up, then I most certainly will. When and if that day ever comes you will see not only a timely maturation of the current plugins but also a proliferation of new ideas and plugins that will literally blow your socks off. Added additional NEMA 240V receptacles into the Outlet module: NEMA 6-30R, NEMA 6-50R. Since adding the symbols legend I’ve had a number of requests for a tool to draw a schedule (similar to how I am drawing the legend). Now that I’ve got a fairly solid routine for pulling the electrical data (I will use much of this same code for the estimating tool) it isn’t too big of a leap to draw a schedule. In the plans I look at every day, there’s an electrical schedule! But what I do see are lighting schedules. They’re all fairly consistent in design. For each type of lighting fixture (called out on the plans usually by a tag on each instance), there is a simple columnar table with only two columns. The first column matches the call out on the plan and the second column details whatever the architect wants to say to specify the fixture. Really nice architects include a 3rd column: A count of each fixture type! Unless the project is really large, the fixture “types” are denoted with a single, capital letter, with (if necessary) a single number following designating a variant of the basic fixture. For instance: Fixture C1 might be some type of fluorescent fixture. C2 the same fixture with a dimmable ballast, C3 the same fixture with an emergency battery in the fixture, C4 is the long version, etc. etc. etc. 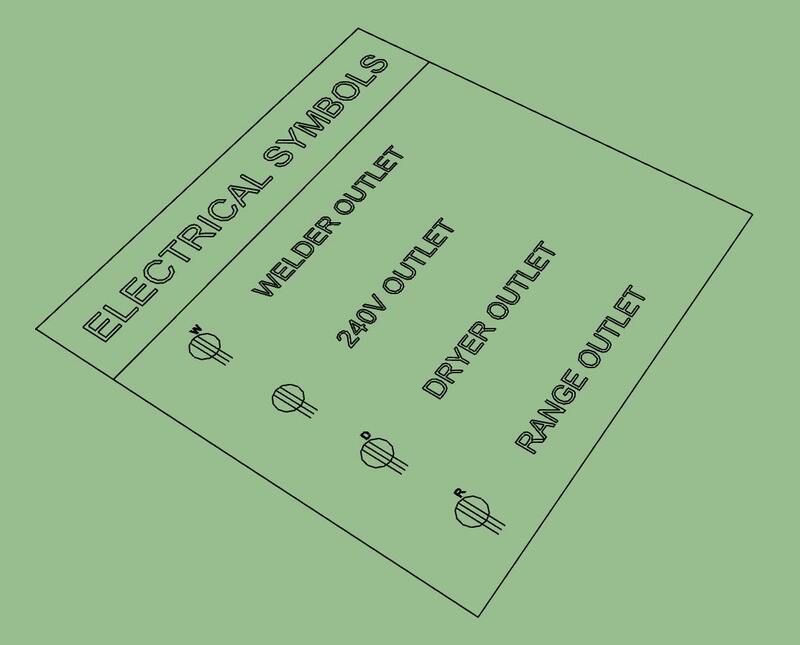 For the REST of the electrical, most of the extra information beyond the symbol will be found in notes, either specific notes from a call out on the plan, or a series of general notes usually on the E1 sheet of the plans. For most job, there will be a single line diagram (The one for the 42 story job I’m currently managing the flow of material to the job runs to 3 full plan sized sheets!) outlining the power flow beginning at the utility feed, through switchboards, meters, safety switches, and transformers, ending at one or more panels. For each panel, there is a schedule which details each distribution panel, shown diagramatically including the intended position of each circuit breaker within the panel, how many watts (NOT kilowatts) each breaker POLE will draw from which electrical phase, Along with common essential information (Indoor or outdoor? Flush or surface trim? Voltage and configuration of the feed to the panel. Main Breaker or Main Lug Only? If Main Breaker, what amperage? Roughly 50% of the time, the buss material is included (otherwise we just use Aluminum, the cheapest). And there’s blank space for any less usual information (200% Neutral, Feed Thru Lugs, Extra Gutter Space, etc.) Also these days, the need for branch circuit breakers to be Arc Fault, Ground Fault, or Dual Function is frequently part of the schedule. For the electrical devices which Medeek Electrical makes to easy to place, I’ve NEVER seen a set of plans that calls out the box! At most, there will be wording in the plans, in the Electrical Specifications section, that requires the use of a particular brand, or “all boxes must be metallic”, rarely (and on large projects only) will I see exact boxes called out and when I do, it’s in a specification like “Electric Boxes and Wiring shall …” and continue with a bunch of obscure stuff that narrows the choice down to a single brand’s particular rapid installation alternative and end with “Such as Cooper Wiring Devices EzInstall System (or approved equivalent)” Note: I made up the “EzInstall” and it’s usually impossible to find an equivalent that the specifier will approve! 24 15A 120V Tamper Resistant Duplex Receptacles, Commercial Grade. 27 15A Single Pole, Decorator Style Switches. Now THAT would be a real timesaver! I’ve spent HOURS doing “take offs” manually counting these things. @MikeWayzovski I created my alternate ego, "at"sjdorst-doppleganer, for a very specific and limited purpose - to have an alternate identity with my work hardware, OS, and License type in the profile. I’ll be using it only when (actually, I’m hoping it’s “if”) I need advice that is specific to my work machine - hardware and License problems only. Other than that, I’m going to do all my posting under my normal handle “at” sjdorst. I’ve been trying to add the Electrical extension to the warehouse since February but for whatever reason the system will not allow me to add a listing. Perhaps someone can help me expedite this process, I would really like to get this plugin out to the general audience, I think a lot of people will find it useful and even affordable.